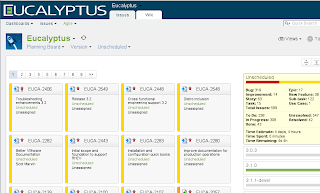 It's been few weeks that Eucalyptus 3.1 have been (highly) available, and securely powering quite a few installations for the delight of Cloud Administrators, and all Cloud population. Eucalyptus 3.1 brings quite a few changes, the most obvious within the code itself (more in the Release Notes, Rich's blog, Greg's blog, Garrett's blog), but a lot is happening without. Some of the behind the scenes work, is targeted to support QA (more in Vic's blog, Kyo's blog), and dev-test. Our IT team, responsible for the happiness of QA and dev teams, is the first customer of Eucalyptus, and it is always on top of the automation game (check Andrew's blog, Harold's blog, the recipes project). Eucalyptus 3.1 opened up quite a few fun configurations and possibilities, and I'm looking forward the next release of Silvereye, or the next crazy setup they can devise. Perhaps the most visible changes, are related to the way we interact. First and foremost the code. We moved all our code development to git and GitHub where you can watch it, fork it, or otherwise enjoy it in any way you like it. All the old branches and releases are tagged there, if archaeology is your cup of tea. 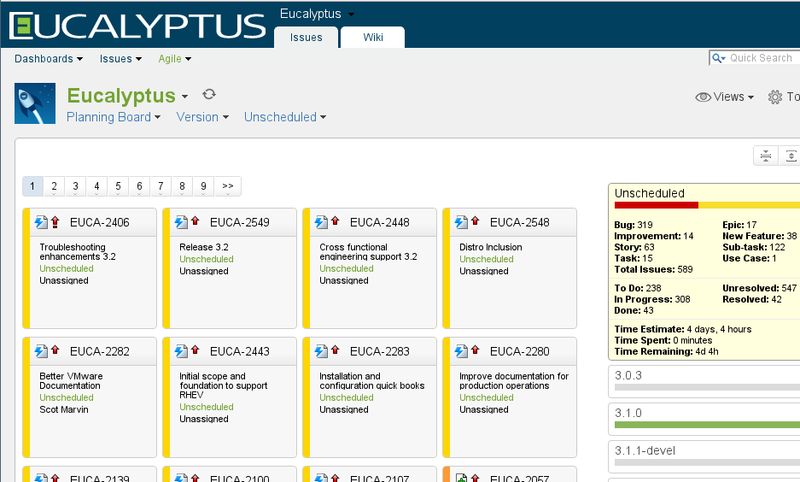 Eucalyptus 3.2 is coming fast: make sure you got Eucalyptus in your watch list. Issues, bug reports, features requests are the lifeblood of any project. We are bringing all of them closer to our development team, and to the release process: you can now find all of the above in one place. A part from the usual operation (create, search, comments, follow-up, watch issues), you can get high level stats, check the Road Map, follow the progress on the next release and more. Explore it, and let us know how you like it. We also have pages representing our progress and status for each distro: we are in alioth for Debian, we have a wiki page for Fedora, and of course we are on Launchpad. The latter has served has faithfully as bug tracker, and code repository for a long time, and now we'll keep using it to interact with Ubuntu. And of course you can always join, or check interesting Eucalyptus related projects. As usual, for all questions, comments, or social interactions you can find us on the forum, mailing list, or IRC. If you liked this Wind of Change, just holler.